For the third time in the last four seasons (and fifth in the last decade), the green boys from Jeonju claimed the top honor. Jeju United gave them a run for the first couple months of the season, but by week 13 Jeonbuk took a hold of the top spot and never let go. Jeonbuk also claimed most of the end season awards with Choi Kanghee taking Manager of the Year, Lee Jaesung the MVP award, and Kim Minjae took Young Player of the Year. Lee Jaesung and Kim Minjae were joined by Lee Seunggi and fullbacks Kim Jinsu and Choi Chulsoon in the 2017 K League Classic Best XI of the Season. Jeju enjoyed one of their best seasons as of late, finishing second in the table, but inconsistent performances saw off any attempts to push Jeonbuk for the title. Young players like Lee Changmin and Ahn Hyunbeom were bright spots for the islanders. It was a rebound season of sorts for Suwon as they finished 3rd. Brazilian forward Johnathan was easily the star of the side as he was hugely important for the Gyeonggi outfit. A solid season(?) for Ulsan as they finished 4th and claimed silverware in the form of the KFA Cup (more below). A disappointing season for the capital side in Seoul. 5th place and knocked out of the KFA Cup by Busan IPark. Hwang Sunhong’s side never got it together and it was apparent from early on it wasn’t going to be their year. Considering their history, it was a disappointing season for Pohang as they couldn’t crack the top half of the table. It was a very good season for Daegu FC in their first season back in the Classic. Many (including yours truly) tipped them for relegation spots, but they comfortably finished above the dogfight. Incheon once again proved to be the “Sunderland” of the K League as they somehow managed to avoid not only the automatic relegation, but also the relegation playoff spot with a late season push. It was a poor season for the other POSCO side as Jeonnam barely avoided the relegation playoff. Sangju survived by the skin of their teeth (and some iffy refereeing) in the playoff match. Back to the Challenge for Gwangju. There was at least a little drama in the Classic title chase, there was really none of that in the Challenge. Gyeongnam came out the gates on fire and never let up until the end when things were firmly in hand for the southeast side. Busan started strong, but they could never get one over their nearby ‘rivals’. Brazilian forward Marcao was to Gyeongnam what Johnathan was to Suwon – a major source of goals and points. Busan strolled to second-place, but fell short to Sangju in the playoffs losing on spot kicks with Ko Kyungmin’s skied effort the only miss. The biggest story in the Challenge was the tragic death of Busan IPark manager Cho Jinho near the end of the season. The Busan boss, a surprise appointment in the offseason, suffered a heart attack on the way to the club’s facilities, and efforts to resuscitate him were unsuccessful. Lee Jeonghyeop honors the late Cho Jinho after scoring. Photo credit: Yonhap News. The police boys in Asan finished 3rd, and made it to the playoff second round before Busan sent them off. After a terrible start to the season, Seongnam FC made a run that allowed them a respectable 4th place finish and playoff appearance. After making the playoffs last year, Bucheon FC fell just short this time around – 1 point behind Seongnam for 4th. Suwon FC wasn’t able to hold anything from last season’s Classic appearance as they finished well off the playoff pace. Anyang finished well behind the playoff sides, but perhaps a little bit of improvement over last season? At least their fans got to “officially” vent at the hated FC Seoul as they faced them in the KFA Cup. Seoul E-Land continues to disappoint as they cannot find anything that resembles a promotion capable side. Ansan? The new ‘Greeners’ side made their debut in 9th. Daejeon? Oh boy… despite holding onto the talented Hwang Inbeom, Daejeon was rooted to the bottom of the Challenge a full 50 points behind winners Gyeongnam. Sangju players celebrate after Joo Minkyu seals their top flight status in the playoff match against Busan. Photo credit: Yonhap News via Naver Sports. For the first time since the promotion-relegation playoff was introduced a few years back, the Classic side defended their place in the top flight. Yeo Reum gave Sangju a vital away goal early in the first leg at the Gudeok. Romulo leveled things on aggregate in the second leg from the spot for Busan. Both sides saw goals slightly controversially chalked off late that would have seen the tie avoid extra time and penalties. But with the assistance(?) of VAR we were “gifted” some extra drama. Sangju converted all five of their spot kicks while Ko Kyungmin skied his effort over, meaning it will be at least another year for Busan in the Challenge and another year in the Classic for the army boys. Ulsan lift the Korean FA Cup, defeating Busan 2-1 on aggregate. Photo credit: OSEN via Naver Sports. While a Classic side ultimately took the nation’s domestic cup, National League side Mokpo City, and Challenge side Busan IPark gave a little glimmer of ‘Cinderella’ flair to this year’s contest. Last year’s winners, Suwon Samsung, went out in the semifinal (on penalties) to the aforementioned Busan IPark. The Challenge side – who lost in the final – saw off four Classic sides from the Round of 32 to the semis: Pohang (32), Seoul (16), Jeonnam (QF), and Suwon (SF). Mokpo City entered the competition in the third round and made it all the way to the semifinals. It could be said the National League side was a tad fortunate in that they avoided many of the stronger sides on the way, seeing off Changwon City (3R), Yangpyeong FC (32), FC Pocheon (16), and Seongnam FC (QF) before falling to eventual winners Ulsan. Ulsan entered with all the Classic sides in the Round of 32. On their way to the championship they defeated: Chuncheon FC (32), Gyeongnam FC (16), Sangju Sangmu (QF), Mokpo City (SF), and Busan IPark (F). In the final, Kim Seungjun and Lee Jongho scored twice at the Gudeok to give Ulsan a commanding lead before Lee Dongjun scored late to give Busan a small ray of hope going into the second leg. It wasn’t to be for the Challenge outfit though, as Ulsan shut things down to keep the second leg at 0-0 and win 2-1 on aggregate. Attendance: The number of spectators continues to be a major problem for the league. 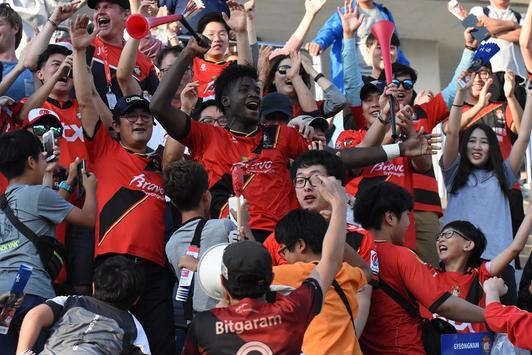 FC Seoul averaged about 16K for the season, and only them and Jeonbuk (average 11K) averaged over 10,000 spectators for the season. Only one match – the opening weekend ‘Supermatch’ – saw attendance over 30K this past year. VAR: VAR (Video Assisted Refereeing) made its debut in the K League, and to say it wasn’t a particularly smooth introduction is probably an understatement. Many VAR decisions seemed controversial and many referee mistakes went unchallenged. The system also seemed to disrupt the match flow and add some confusion to players, fans, and coaches about what was going on. Video assistance for officials is likely here to stay, but it clearly needs some more work. Suwon’s Johnathan carried the side to 3rd place in the Classic and won himself the golden boot award with 22 league goals. Pohang’s Yang Donghyun finished second with 19 goals. Yang was also the highest scoring Korean. FC Seoul’s Dejan Damjanovic also scored 19 goals on the season. Marcao was the top Challenge scorer with 22 goals for Gyeongnam. Pohang’s Son Junho was the top assist giver in the league with 14 to his name. Seoul’s Yun Illok finished second with 12. Jang Hyukjin (Ansan) was the top assist giver in the Challenge with 13. Suwon’s Shin Hwayong finished with the most clean sheets to his name – 13. Daegu’s Cho Hyunwoo was second with 10. Seongnam’s Kim Dongjun kept the most clean sheets in the Challenge with 14. Ulsan’s R League side cruised to the R League title with 48 points, Suwon finished second with 38 points. 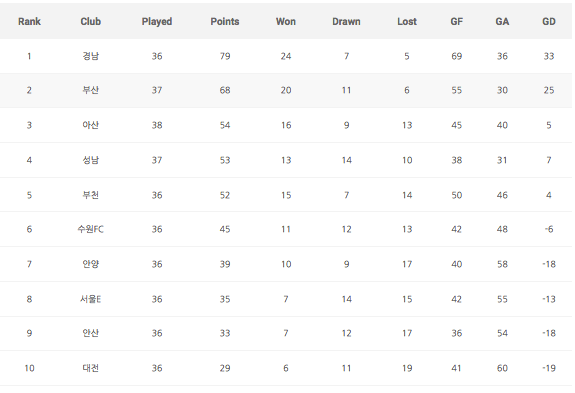 FC Seoul’s U18 team (Osan High School) won the K League Junior Group A overall title with 47 points (21 pts, 26 pts) ahead of their rivals from Suwon Maetan High School (45 points overall, 22 pts, 23 pts). 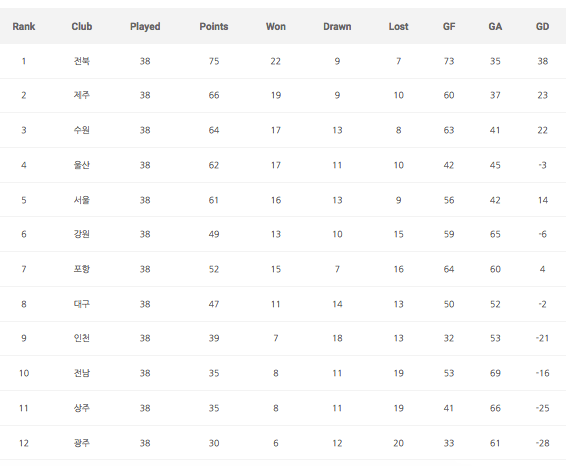 Ulsan Hyundai’s U18 team (Hyundai High School) won the K League Junior Group B overall title with 47 points (23 pts, 24 pts). Pohang’s Jecheol High School finished second overall with 35 points (19 pts, 16 pts).